Looking for something to do in Montreal? In the Flaneur Walks Pamphlet Series, writers create poetic/conceptual walking tours of the cities in which they live in order to guide readers through a re-exploration, re-habitation and re-experiencing of their urban space. Readers purchase the pamphlets /maps and take the tour as the writers instruct. Eye opening, interactive, and fun. Come to the Launch Party Weekend and take the walk with Julie in person. Screw rose-colored glasses! Try hot pink ones, and maybe wear a bear suit. 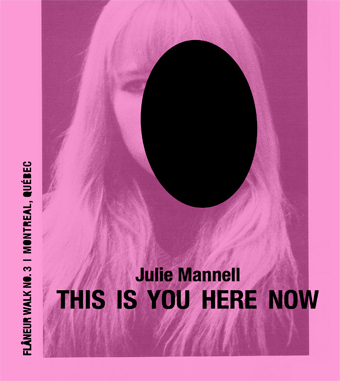 Julie Mannell's This Is You Here Now, is beautifully vulnerable but never shy, and it's these two qualities that guide readers through a Montréal they otherwise may never have known. Traverse posh neighborhoods as a nanny, tiptoe quietly through the cathedral with your junkie lover, drink a peanut butter milkshake, and slump down in the best seats on the bus. 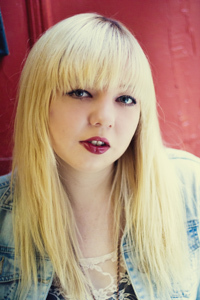 No matter where she takes you, Mannell's x-ray vision and poignant insight will make you laugh as your heart shatters. Slightly disorienting, but life can't all be one shiny car ride.